I love SusieCakes. I also love dogs (especially my own). 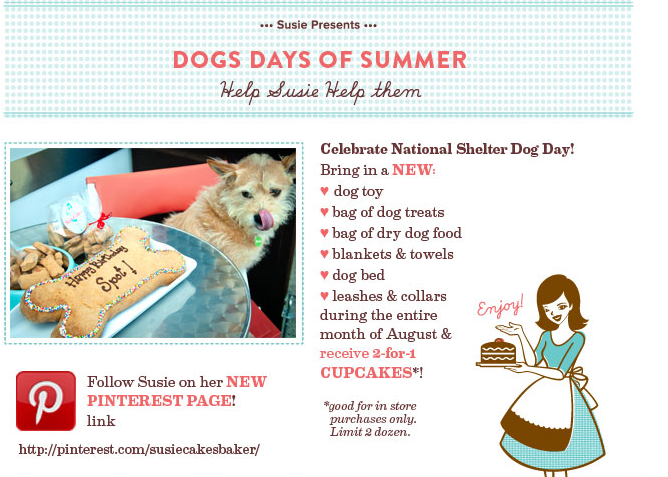 So I had to pass on this special SusieCakes is offering for the entire month of August in honor of National Shelter Dog Day - in exchange for a dog toy, treat, etc. donation you receive 2-for-1 cupcakes (up to two dozen). Complete information below. Find the nearest of the four SoCal or four NorCal SusieCakes here. - Also in August FREE Cupcake News, Sprinkles has a delivery special. Order three dozen for delivery, the third dozen is free. Promo Code: SUMMER.